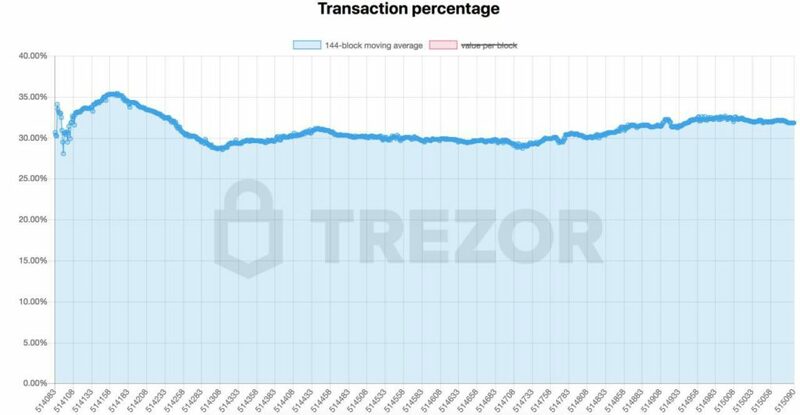 On March 22, BitMEX Research published a follow-up article to its September 2017 analysis on Segregated Witness (SegWit) transactions compared to Bitcoin Cash, and the results aren’t good for big block supporters. Bitcoin Cash was created as an alternative coin with bigger blocks unlike Bitcoin’s Segregated Witness (SegWit) block weight optimization upgrade in August 2017. While SegWit gave the option for Bitcoin users to upgrade their wallets and receive the benefits of approximately 41% more capacity, Bitcoin Cash required users to upgrade their wallets, adopt a new transaction format, and use an entirely new coin. SegWit is currently winning the hearts of transacting users, and, at the given pace, it appears doubtful if Bitcoin Cash will ever catch up. According to BitMEX Research, 6.1 million SegWit transactions have taken place since the launch of rival Bitcoin Cash — 20.1% more than Bcash’s total number of transactions. However, Bitcoin Cash had a one-month head start over SegWit. When the timeframe is adjusted, SegWit actually has a 31.5% advantage over Bitcoin Cash. There was a sharp spike in Bitcoin Cash transaction volume when it launched; in contrast the SegWit upgrade was more gradually adopted. This is likely to be related to the investment flows and excitement of the new Bitcoin Cash coin, which may have driven short term adoption […] Three months after the launch of Bitcoin Cash, on 31 October 2017, SegWit transaction volume overtook Bitcoin Cash and has remained in the lead ever since. SegWit has begun to meaningfully impact system-wide capacity, potentially reducing fees and benefitting even users who choose not to upgrade to the new transaction format. Despite SegWit’s clear lead, Bitcoin Cash proponents will undoubtedly continue referencing ‘Satoshi’s vision’ i.e. cheap transactions, in their support of bigger blocks. Nevertheless, Bitcoin fees have never been lower, which has significantly undermined the narrative of big block supporters in recent months while Bitcoin’s nascent Lightning Network is already delivering instant and even cheaper transactions. Meanwhile, many supporters of Bitcoin (BTC) will continue calling it ‘Bcash’ and a scamcoin, which attempts to co-opt the Bitcoin brand against the backdrop of an unsuccessful propaganda campaign. The Bitcoin Core (BTC) community relies on internet hate mobs, trolls, sockpuppets, censorship, DDoS attacks, vote manipulation, harassment and character assassinations. The Bitcoin (BCH) community is welcoming, supportive, and appreciates freedom. What do you think about SegWit’s lead over rival Bitcoin Cash? Let us know in the comments below! Disclaimer: The views and opinions expressed in this article are solely those of the author and do not necessarily reflect those of Bitcoinist.com. Claims made in this article do not constitute investment advice and should not be taken as such.